Tags are displayed on your blog attached to posts or as a tag cloud in your sidebar. Clicking on a tag name will take your readers to all posts tagged with that term. When your readers click on a tag link on a post or in your sidebar it loads a page with all posts that use that tag. The Tag Cloud widget displays a list of your top 45 tags that you’ve assigned to posts. Tags are normally added before your publish your posts by typing your desired tags in the Add New Tag text box and then clicking Add. You can add tags one at a time by clicking the Add button or hitting the Enter on your keyboard after typing each tag. Or you can add multiple tags at a time by separating them with a comma as you type. If you forget to add a comma between your separate tags the system considers the words to be one tag. To remove a tag from a post just click the X to the left of that tag. 1. Clicking on Choose from the most used tags. 2. Now click on the tags you want to assign to the post. You can quickly change tags assigned to posts by going to Posts > All Posts. Once posts are located you can use Quick Edit or Bulk Edit to change the tags assigned to posts. 3. Delete the tags you want to remove or type your new tags. Remember to add a comma after each new tag when using multiple tags. 4. Delete the tags you want to remove or type your new tags. Remember to add a comma after each new tag when using multiple tags. 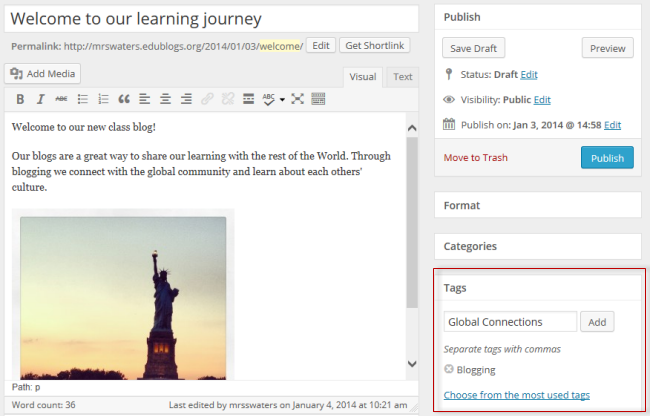 You can also create new tags and manage existing tags using Posts > Tags. 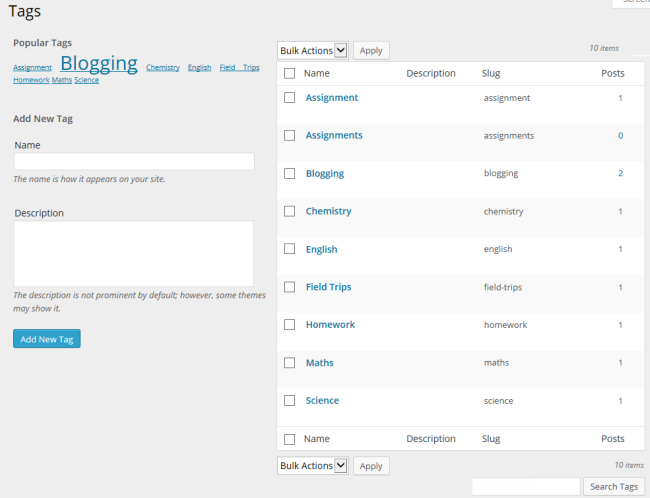 On this page you’ll see a list of your existing tags and an option to create new tags. 1. Type your new tag in the Name text box. 2. Add a description for your tag (optional). 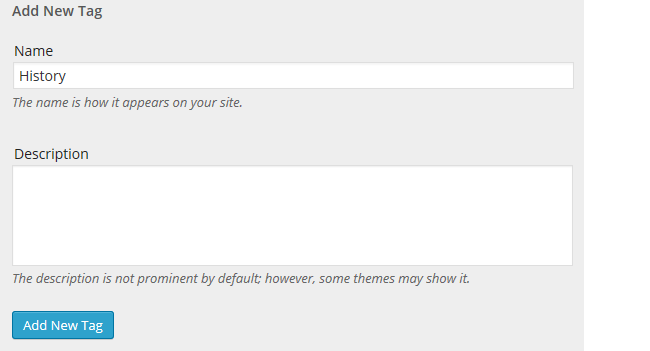 The description appears as a tooltip if you use the tag cloud widget on some themes. 3. Click Add New Tag. The Posts > Tags page in your dashboard displays all your existing tags and shows the name and number of posts belonging to each tag. Edit – takes you to a separate page where you can edit the name and description. Quick Edit – opens up an edit box where you can rename the tag. Delete – used to delete a tag. This doesn’t delete the posts. 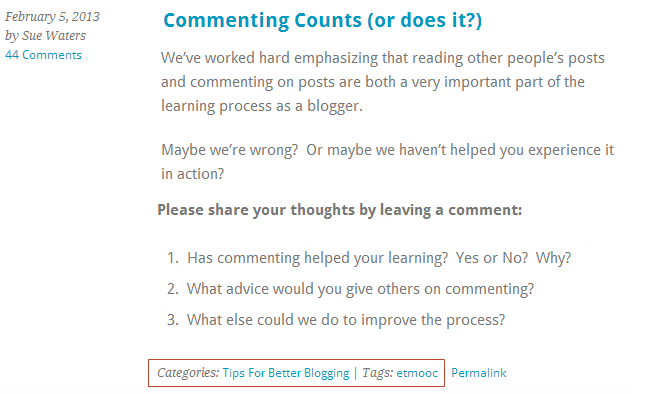 View – loads a page on your blog where you’ll see all the posts that use that tag. You can use the bulk action feature to bulk delete tags at the same time. 1. Select the tag you need to delete using the checkbox to the left of the tag name.